Photographs by Toni Siebert and David Karp, 3/17/2010, CVC. Photo rights. Source: Received as budwood from Robert Bream of Lindsay, Ca, 1994. Parentage/origins: Apparently a bud mutation from a mature Tarocco blood orange tree of the VI 384 budline originally purchased from Willets and Newcomb Nursery. JB: In October of 1994 Dave Gumpf and I were at Lindcove for work and a meeting. After the meeting Bob Bream approached Dave and mentioned that he had a Tarocco blood orange tree at his home that produced large well colored fruit and which might be an improvement over our old VI 384 budline of Tarocco. After we finished our work at the station we stopped by the Bream home and met with Bob Bream there. Mr. Bream offered to give us cuttings from his tree to enter into the program to compare the fruit quality with the existing CCPP Tarocco, and if it was an improvement, to make it available to growers through CCPP. 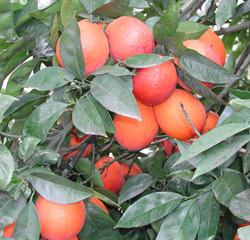 OJB: Bream Tarocco is a medium-large to large blood orange variety with few to no seeds. Tarocco blood orange if one of the major blood orange varieties of the world. The distinctive color is a natural mutation and is due to the presence of anthocyanin, the same plant compound that is responsible for the color of pomegranates. The distinctive color requires a chilly winter to develop properly.